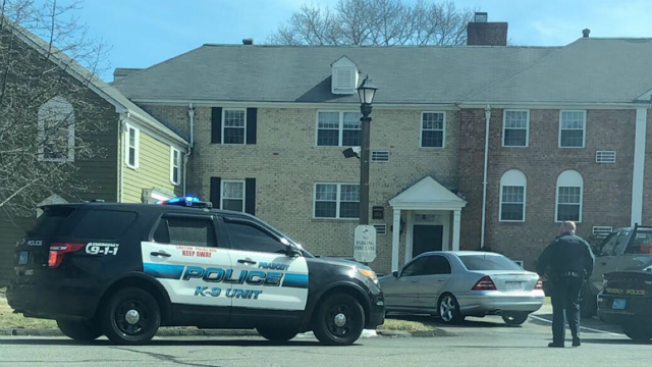 Police activity was reported in the Beverly Commons area of Beverly, Massachusetts, on Tuesday. Warrants have been issued for a Massachusetts man who state police say fled on foot after a traffic stop and pursuit in Beverly on Tuesday morning. Authorities said Andrew Murley, who was driving a Chevy Silverado pick-up truck, was stopped by an officer on Brimbal Avenue at about 10:30 a.m. for operating with a suspended license. After the officer spoke with Murley, police said he fled the scene. Murley was pursued onto Route 128 south and onto Dodge Street where his pickup truck jumped the curbing into the North Beverly Plaza parking lot. He then fled through the lot where he exited onto Tozer Road and police lost sight of him. Police said Murley's truck was later located in a nearby condominium complex but he had taken off by foot. State police sent in K9 units and their Airwing unit to scour the area but the search did not turn up any results. Warrants have been issued for Murley for operating after license suspension, reckless operation of a motor vehicle, refusal to stop for police, and several other motor vehicle infractions.